ToyBoxTales.com » Blog Archive » All Things Are Possible! 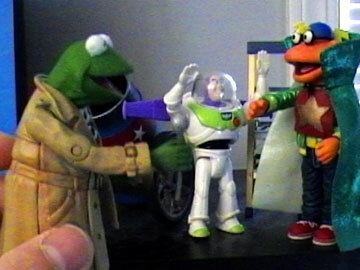 Kermit focuses his report on Buzz Lightyear who believes that toys can’t fly. This entry was posted on Thursday, March 11th, 2004 at 12:00 pm	and is filed under Buzz Lightyear, Faith, Kermit, Kermit on Location, Pastor Karl, Scooter, Season 2, Special Edition, Trust. You can follow any responses to this entry through the RSS 2.0 feed. You can leave a response, or trackback from your own site. I teach a Wednesday night class for smaller children and I am always looking for fresh and fun teaching ideas to share the gospel message. I am so excited and blessed to have found your site! I am going to us your videos as an opening into my lesson each week to get the thoughts rolling! What a fun way to relate to our children using things they see every day…their toys! Blessings to you in all that you do!